Last week, we posted the video introducing the team that is moving to Ocala, Fla., to join with existing members in a restart of the Grace Brethren Church there. Here’s “the rest of the story,” supplied by Pastor Todd McQueen. Meet the team (below) who are in the equipping phase of this effort. Team Ocala’s story includes in short the powerful movement of three vastly different families. From a family called from the rural countryside of Ohio, to a family deciding how to gift their newly-attained retirement years, to a young family from central Florida with two small children, the interwoven tapestry of God’s handiwork continues to astonish. Todd and Deborah McQueen began their journey as God called them from a steady job with the State of Ohio to seminary in Winona Lake. What began as a fast paced study toward military chaplaincy morphed into local church leadership. With a few cues from friends in VisionOhio, the idea of church planting first took root. Serving in a couple of equipping model churches (Winona Lake, Ind., Grace Brethren Church and Community of Hope Grace Brethren Church, Columbia, City, Ind.) and under the powerful direction of Pastors Kip Cone and Jeremy Wike, their spiritual journey continued when Tom Avey connected Todd with Pastor Matthew Wheelock in Sebring, Fla. Simultaneously moving to Florida, completing seminary studies, and taking up the local church training under not only Pastor Matt, by studying under the twice weekly teaching of Pastor Randy Smith as he takes his GCBI students from Genesis to Revelation. Within hours of uploading his last seminary assignment, Todd was approached by Pastor Matt. Together they came up with a plan: take three months to gather a team, nine months to equip that team, then, by September, relocate that team three hours north to Ocala, Fla., in order to replant the Grace Church of Ocala. A huge undertaking within a short period of time but one which God was already at work preparing two other families. Preparing people for ministry takes a lot of elbow grease. Pastor Matt’s request that Todd develop Team Ocala would eventually blind-side him with the idea that it would cost him more than he had ever dreamed. Not only would he have to part with one of the best disciples, but his sister and their two kids who spend time at his house every week! Last Sunday was a tearful time as he admitted this to the body after the video announcement was made. Larry and Avis Hunt may have just entered the realm of the retired, but they are anything but complacent and sedentary! They are one of those couples who not only attend, but proactively purpose to do works of service with youthful tenacity. 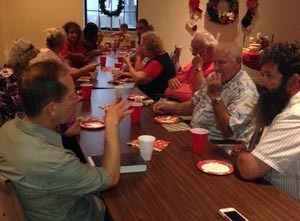 Over the period of a couple of months, Todd and Deb hosted a fact finding fellowship time in their home for anyone who may be either curious about or wanted to join Team Ocala. To Todd and Deb’s surprise, Larry and Avis showed up on one of those evenings. Their path has been continually illuminated in what Larry calls, “Now I move – Now you move” scenario. God began answering their prayers about retirement service with answers while they were camping. God moved in and around them after they took steps that eventually meant putting their home up for sale. Each step was an act of obedience followed by more information from God. Of the many examples of the process include looking for a home in Ocala. After they had decided to put their home in Sebring up for sale, they spent a long weekend in Ocala. After the Sunday service they took the advice of a lady attending church that morning and went to visit the retirement community in which she lived. This turned out to be another illustration of God using circumstances to shed light on His will. Just hours before, a gentlemen had put a for sale sign in front of his home and within a few weeks, Larry and Avis had signed an agreement with him! The examples of how God began His good work many years ago in the lives of a small group of people could go on for numerous pages, but suffice it to say that part of replanting the Grace Church of Ocala has been the miraculous movement of God in the lives of many. Many who had no idea that they would influence the formation of a Team years later. The hard work of restarting a church looms around the corner and the team will be working very hard together as they all prepare to move and for the arduous years ahead. The goal from the outset is to make disciples who make disciples and part of this means being prepared to send off their best disciples who then go to make disciples.